At last week’s National Baccalaureate convention, the ‘Glastonbury analogy’ was used to describe the way we’re choosing to develop this new curriculum framework. I don’t know if this is its first outing, but the idea is that lots of different people who have a shared purpose are coming to the same large festival which has common organising principles but they will be in different fields or tents. I’ve never attended Glastonbury so I may have got this wrong but you probably get the idea without any need to extend the analogy to headline acts, leaky tents, muddy fields or non-functioning toilets. Thanks to Highbury Grove School headteacher Tom Sherrington we now have our ‘festival’; a National Baccalaureate Trust with a public identity supported by a broad range of schools and organisations. At the convention, Tom shared the simple framework which his school has adopted for the 14-19 curriculum for all students. He also expressed a sense of urgency because he wants to ensure that all his students start to benefit straight away. The idea is that other existing Bacc models can fit within this framework and can sit within the overarching National Bacc model; hence the Glasto-metaphor. Many of us share that impatience to get started. 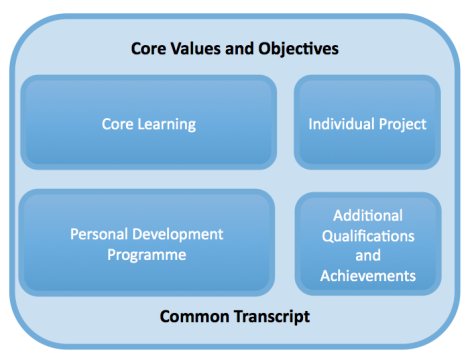 Over time, the schools and colleges which have signed up to this framework can develop and share their practice and refine the model as it is built from the ground up. The important thing is that it is a coherent response to a genuine perceived need for a broader, more balanced and inclusive curriculum for this age group based on a clear sense of what the educated 19 year old should aim for. We are not waiting for government to define the purpose of 14-19 education but getting on with it ourselves. The politicians can catch up later! At Newham Sixth Form College (NewVIc), we are using the Sixth Form Bacc developed by sixth form colleges a few years ago as a useful way to value depth and breadth of learning as well as students’ personal development. It’s been very motivating but it is only offered in 12 of England’s 93 sixth form colleges. The two frameworks clearly overlap and I will be suggesting that we should become early adopters of the Nat Bacc and we could soon find ourselves offering something which has much greater recognition and currency. At the convention, we also heard from professors Ann Hodgson and Ken Spours who gave us a historical perspective and some conceptual scaffolding to understand where we’re coming from and what we’re doing. It’s important to understand where similar initiatives have failed so that we can go with the grain of our system while also embracing reform. In their discussion paper Developing a national baccalaureate system in England: a policy learning approach Ann and Ken argue for 4 levels of understanding: international, national, systemic and professional and a clear typology of the various approaches. Track-based reforms which have either sought to broaden general education or to diversify vocational education. Linkage strategies which preserve tracks while building bridges between them. Unified approaches of which the Welsh Bacc is the only current example in the UK. The English National Bacc project falls into this category. These can include overarching frameworks, open modular / unitised systems and grouped baccalaureate awards. Their conclusion is that we need ‘policy learning’ for an English context; an English translation of the Bacc concept which can build on our existing qualifications system while both modernizing and enriching both our academic and vocational traditions. Hodgson and Spours are making the case for a unified framework as an ‘organizer’ of the different curriculum traditions we need to build on. Such a development could broaden general education, enrich vocational education and reinforce the linkages between them by promoting a common core of learning beyond the taught curriculum. This is a good place to start and it feels good that we have started. This entry was posted in Education and tagged 18 year olds, A levels, curriculum, Education, Glastonbury, Ken Spours, liberal education, National baccalaureate, young people. Bookmark the permalink. What an inspiring event it was. Here in Wales we are happy to share our lessons learnt developing the new Welsh Bacc. Thanks Mike. I think England can learn a lot from Wales and Scotland about how to define our shared educational aims and give our system values and purpose.